Wise Disk Cleaner is all in one system optimization and performance increasing tool used to boost PC speed. It can erase any error based logs, temporary, junk, internet cookies and spam files to speed up overall performance. 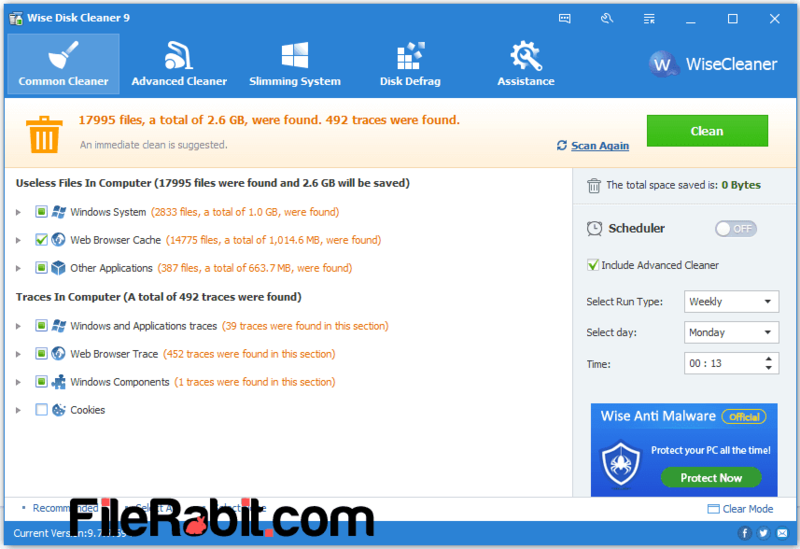 It works similar to Piriform CCleaner but there were several functions including less resource taking, multiple themes, light and fast optimizing makes it lovable. The layout of Wise Disk Cleaner can be switched from Classic mode to Clear mode which makes it easier to operate. Operating Systems are always leaving footprints in the shape of software installation logs, login information, temporary files, internet cookies, web browser traces, cache and other similar useless files. These files are always bad for user because they will hang PC, stuck up applications, slowing down start up and shutdown speed and loading of key software as well. 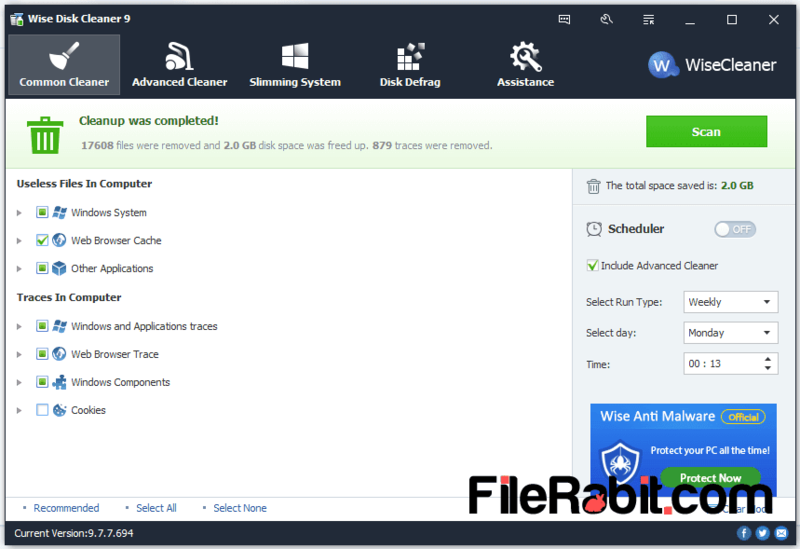 However, through wise disk cleaner, use advanced cleaner that allows to search for useless files, clean them with permanent deletion and also offer you more free space in a reward. Unresponsive OS and programs will makes a user lazy and angry because each computer user needs faster and responsive actions. Wise disk cleaner can remove traces and unused files immediately to protect user’s privacy alongwith transforming a slower machine into responsive one. Junk files are also another garbage type that covers huge HDD/SSD space. 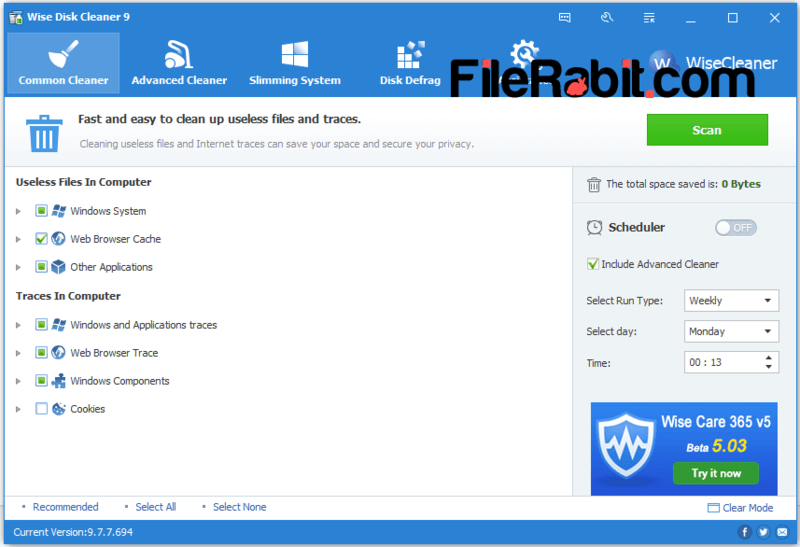 Common Cleaner: An all in one cleaning tool or clean with 1-click feature that will scan, find and remove unnecessary files in fast and easier way. This feature includes every type of junk files alongwith cookies and logs from Chrome, Firefox, IE, Opera and Windows Installation directories as well. Advanced Cleaner: A professional function used to hunt dead and unused files at their own hard disk drive. By default, it shows all of local drives to select and scan individual or perform a clean to all local hard drives. This feature will find and delete thumbs, error reports, temp files, recovered files and index files. Slimming System: It covers language files, Windows installation and downloaded files, help files, sample videos, music or images files and default wallpapers. These files are categorized in multiple items with additional information including size, location and suggestion. Disk Defrag: An advanced feature used to increase hard disk life and improve overall health of HDD/SSD. Disk defrag is used to categorize files and folders in perfect form. The empty area will be transfered to new area that should give us free space as a reward. It shows Quick, Full optimization and Defragment very well. Exclude Settings: Wise disk cleaner allows you to exclude custom directories so it will never find and delete files from target directory. Many of software are using recovery and backup files for the sake of data protection so these programs and their folders can be skipped through going in Exclude option under settings. Free up Disk Space: Although, WDC is all in one cleaning tool to get more free space with deleting unnecessary hidden and system files. These files are burden for computer so WDC will delete them easily to save money, time and hard disk space as well.